I recently read a post on Facebook written by a fireman- the post was all about what a difference firemen and EMT's can make... and in the post it said something about how a fireman can make 5 minutes seem like an eternity- referring to the 5 minutes it typically takes a truck to get to your house during an emergency. Tonight I learned just how true that statement is. Zachary has been sick since Monday... nothing major, just a fever and a loss of appetite- it's exactly what Deacon had this past weekend. As the evening progressed Zachary started going down hill... and started sounding raspy and had a bit of a cough. I thought nothing of it as I put him to bed. At about 8:30, Damien, my mom and I were playing cards and Zac's cough started sounding worse... and by 8:50 I decided I needed to go in and check on him- his breathing was VERY shallow and it sounded as if he were choking. I went into his room and knew something was wrong immediately. He was having a very hard time breathing and was turning colors... I gave him to Damien and called my friend Theresa (her husband is a fireman and she's studying to be a nurse)- I told myself (and later realized I actually said this out loud) that if Theresa didn't answer, I was calling 911. I'm not exactly sure what I thought Theresa would do for me- but I just wasn't sure that 911 was the right thing to do... which was dumb- I should have called right away. Anyway- I called 911 and the guy on the other end was amazingly calm- but quick. He kept reassuring me that someone was on the way, but he needed to ask me questions... he told me to hang up the phone and wait outside for the ambulance and they would be here in less than 5 minutes. So I went outside to wait. And I waited and waited and waited... and all the while I hear Zachary in the house struggling to catch a breath. He wanted to cry, but couldn't. He wanted to communicate with us, but he couldn't. All he could do was stare at Damien, terrified, while trying his hardest to just breath. And in less than 5 minutes they arrived... and those 5 minutes were some of the longest minutes of my entire life. It sounds dramatic, I know. But it was horrible. I stood outside thinking, "what the hell is taking them so long- they're right down the street! I could have run there and back by now!" But when they showed up they got right to work- and suggested giving Zac a breathing treatment in the ambulance. They said they would give him a treatment and then we should take him to the hospital... and about half way through the breathing treatment they weren't happy with how he was responding and weren't comfortable with us taking him in- so Zachary got to go on his very first ambulance ride. And as the breathing treatment started helping about half way to the hospital, he started to have a really good time. He was pretty excited to be sitting in an ambulance and hear the sirens going off. We got to the hospital and Zac was a million times better already... though still sounding pretty rough. He was SUCH a good boy throughout the entire ordeal- and boy was he showing off. All the doctors and nurses wanted to come in and say "hi" to him... the boy was a complete ham. 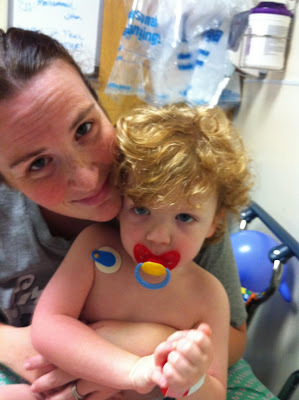 After being in the hospital for less than 2 hours we were sent home with breathing treatments and a diagnosis of croup- he had had an asthma attack at home and the croup was obviously not helping either. Oh my goodness - thay's absolutely terrifyng... so glad that Zachary is ok.